In celebration of the fall returns of hit music dramas EMPIRE and STAR, Fox Broadcasting Company and parent company 21st Century Fox have teamed up with Turnaround Arts, a national program of the John F. Kennedy Center for the Performing Arts, for a new social campaign. As one of the marquee national education initiatives of the Kennedy Center, Turnaround Arts empowers struggling schools with innovative arts programs and arts-based learning across subject areas as a strategy to help address broader school challenges and close the opportunity gap. The #EMPIRESTARGIVESBACK campaign kicks off today in New York at the EMPIRE Season Five Premiere Event, where the original Derrick Adams portrait will be on display. FOX is also launching a collection of merchandise using the Derrick Adams-created image that fans can purchase online at shop.fox.com with all of FOX’s profits going to Turnaround Arts. 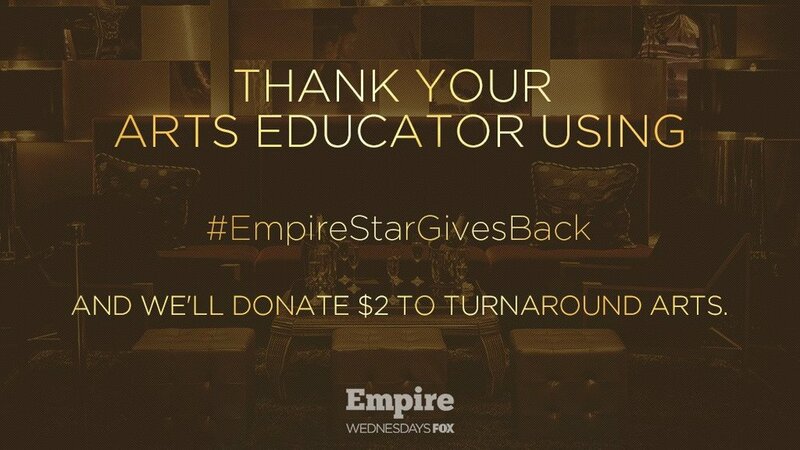 From Monday, Sept. 24, 2018 to Monday, Dec. 31, 2018, FOX and parent company 21st Century Fox will donate $2 (up to $50,000) to Turnaround Arts, for every tweet, retweet or Facebook post using the hashtags #EMPIRESTARGivesBack and #Promo. FOX is encouraging fans to share messages across social platforms, thanking and honoring a mentor or teacher who has inspired their love of the arts. Additionally, actors from both EMPIRE and STAR will celebrate the music and arts educators who have made a difference in their own lives. On the Season Five premiere of EMPIRE, airing Wednesday, Sept. 26 (8:00-9:00 PM ET/PT) on FOX, two years after losing Empire to Eddie Barker (guest star Forest Whitaker), Cookie (Taraji P. Henson) and Lucious (Terrence Howard) are still in the midst of picking up the pieces. The family is now completely dispersed and coping in their own ways after experiencing unimaginable tragedies. Meanwhile, in an effort to reclaim the Lyons’ position in the music industry, Cookie sets her eyes on a talented new singer and rapper, Treasure(guest star Katlynn Simone). Following EMPIRE, STAR (9:00-10:00 PM ET/PT) returns for its third season, picking up three months after the Season Two finale, as Star (Jude Demorest) returns home with a secret, and Alex (Ryan Destiny) and Simone's (Brittany O’Grady) fates are finally answered. Carlotta (Queen Latifah) had been named the president of the label, but her world came crashing down after learning Cassie (Brandy Norwood) killed Jahil (Benjamin Bratt). Cassie tries to make amends, but Carlotta struggles with her grief, and Christine (guest star Patti LaBelle) is caught in the middle. From Imagine Television in association with 20th Century Fox Television, EMPIRE was created by Academy Award nominee Lee Daniels and Emmy Award winner Danny Strong, and is executive-produced by Daniels, Strong, Academy Award- and Emmy Award-winning producer Brian Grazer, Francie Calfo, Sanaa Hamri, Dennis Hammer, Matt Pyken and Diane Ademu-John. Brett Mahoney is executive producer and showrunner for the series. STAR is a production of 20th Century Fox Television in association with Lee Daniels Entertainment. Lee Daniels and Tom Donaghy are the creators. Lee Daniels and Pamela Oas Williams serve as executive producers. Karin Gist serves as showrunner and executive producer. 21st Century Fox is one of the world’s leading portfolios of cable, broadcast, film, pay TV and satellite assets spanning six continents across the globe. Reaching more than 1.8 billion subscribers in approximately 50 local languages every day, 21st Century Fox is home to a global portfolio of cable and broadcasting networks and properties, including FOX, FX, FXX, FXM, FS1, Fox News Channel, Fox Business Network, FOX Sports, Fox Sports Network, National Geographic Channels, Star India, 28 local television stations in the U.S. and more than 350 international channels; film studio Twentieth Century Fox Film; television production studio Twentieth Century Fox Television; and a 50 per cent ownership interest in Endemol Shine Group. The Company also holds approximately 39.1 per cent of the issued shares of Sky, Europe’s leading entertainment company, which serves nearly 23 million households across five countries. For more information about 21st Century Fox, please visit www.21CF.com. The John F. Kennedy Center for the Performing Arts is America’s living memorial to President John F. Kennedy, attracting millions of visitors each year to more than 2,000 performances, events and exhibits. With its artistic affiliates, the National Symphony Orchestra and Washington National Opera, the nation’s busiest performing arts center is dedicated to providing World-Class Art, Powerful Education and an outstanding Memorial Experience to the broadest possible constituency. Across all its offerings, the Kennedy Center is committed to increasing accessible, inclusive opportunities for all people to participate in and learn through the arts, including more than 400 free performances each year and a variety of Specially Priced Ticket programs for students, seniors, persons with disabilities and others.To learn more about the Kennedy Center, please visitwww.kennedy-center.org. Founded under the leadership of former First Lady Michelle Obama, Turnaround Arts bolsters reform efforts at Priority and Focus-designated schools (PK-8) through the strategic use of the arts. Designed to impact every hallway, classroom, staff member and student in the school, the program fuels whole-school transformation. As part of Turnaround Arts, schools receive an array of arts education services designed to increase chances of success, engage communities and raise the visibility of their achievements. Turnaround Arts works with 81 schools in 17 states and the District of Columbia. To learn more about Turnaround Arts, please visit turnaroundarts.kennedy-center.org.